Colorado is an enthusiastic adopter of Direct Primary Care. What does that mean for providers and patients? Colorado is home to close to 10 percent of the Direct Primary Care clinics in the country. The approach's proponents say direct primary care can make health care more sustainable for practitioners and patients. Others are concerned about the model's impact on providers and patients who don't opt in. A new health care approach called Direct Primary Care will get you plenty of face time with your doctor, free or reduced-price screenings, and often 24/7 availability by phone, text or e-mail—all for about the cost of a daily cup of coffee. Colorado is an enthusiastic adopter of the subscription-based health care model, which arrived here in 2009. Today, there are about 90 or so practices across the state, roughly 10 percent of the nation’s Direct Primary Care clinics. They serve about 63,000 patients. Proponents say the model’s advantages over traditional primary care include longer appointments with doctors, a focus on preventive care, and the ability to forge stronger relationships between providers and their patients. Many doctors who have switched report increased job satisfaction. Some advocates believe it is the future of primary care. Skeptics, however, worry that the model creates a two-tiered system: one for those who can afford to bankroll their primary care out of their own pocket in addition to their insurance plan and another for people with lower incomes who rely on public insurance or might not be able to take on an extra monthly bill. This paper explores Direct Primary Care, analyzes how it might solve some of the problems plaguing the health care system, looks at policy options, and takes you inside one of the state’s Direct Primary Care practices. The Golden Stethoscope is a Direct Primary Care clinic in Golden, Colorado. Read about how its founder got interested in Direct Primary Care and how it's changed her experience as a primary care physician. Direct Primary Care is a simple concept: a flat fee covers many basic health care services from a primary care doctor. Patients pay a monthly fee, generally about $85.1 Direct Primary Care practices don’t accept health insurance. The menus of services in Direct Primary Care clinics vary. The fee generally covers at least monthly patient visits, and in some cases also covers unlimited visits or 24-hour access. Prescriptions, lab tests, X-rays, and minor procedures are generally offered without additional fees or at deep discounts. Some doctors even make house calls, usually for an extra charge. The goal is to establish a strong doctor-patient relationship that focuses on preventive medicine and results in healthier outcomes. Specialty care and emergency services are not included in the Direct Primary Care package, so most patients also buy an insurance plan—usually one with a high deductible. Some patients under the age of 30 are eligible to buy so-called catastrophic plans, which have low premiums and high deductibles. Patients over 30 don’t have that option, but could still choose from high-deductible plans. Direct Primary Care clinics say that they save money because they don’t have to deal with insurance claims and other overhead costs. And with a more predictable source of income, they don’t need to see as many patients to keep the lights on, giving them the ability to offer longer visits with the doctor. Physicians told the Colorado Health Institute (CHI) that traditional primary care providers typically spend about 12 to 15 minutes with each patient for routine visits, but that Direct Primary Care visits are often between 30 and 60 minutes and can include integrated behavioral health care screenings in some clinics. Each Direct Primary Care provider maintains a panel of 600 to 800 patients, compared with approximately 2,300 patients in the panel of a traditional primary care provider (See Table 1). In some respects, Direct Primary Care users are managing their health like they would manage their car maintenance. Routine work like oil changes and tune ups are paid out-of-pocket, with insurance covering bigger ticket items such as collisions or hail damage. Patients use Direct Primary Care for routine health services and turn to insurance to help pay for expenses such as surgery and hospital stays. Under Colorado state law, Direct Primary Care providers cannot contract with Medicaid or its members.2 That means they are not allowed to bill Medicaid. In addition, Medicaid members can’t pay out-of-pocket for Direct Primary Care services. 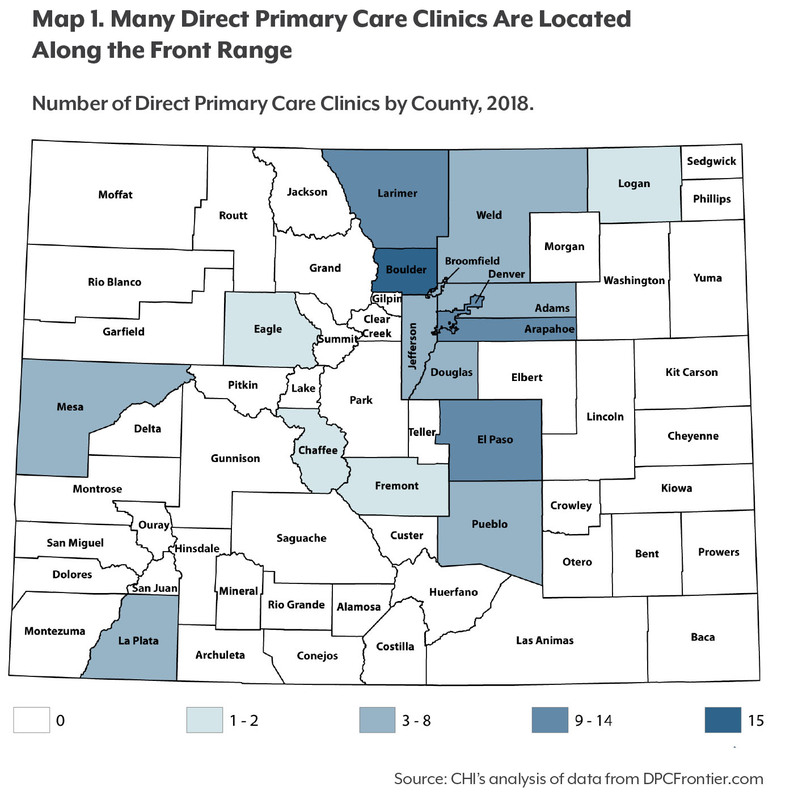 Colorado had roughly 90 Direct Primary Care clinics as of May 2018, according to DPCFrontier.com, an industry support website founded by Direct Primary Care advocate Dr. Phil Eskew. (See Map 1). Most of the clinics are located along the Front Range near cities, including Boulder, Denver and Fort Collins. But there are clinics as far northeast as Sterling in Logan County and as far west as Grand Junction. CHI estimates that 86 percent of Coloradans — more than 4.6 million people — live within a 15-minute drive of a Direct Primary Care clinic. The state accounts for only two percent of the U.S. population, yet it has roughly 10 percent of the nation’s 845 Direct Primary Care clinics. Direct Primary Care clinics were well-established in Colorado when lawmakers passed legislation in 2017 exempting them from state insurance regulations.13 So, growth might be driven less by friendly legislation and more by an entrepreneurial spirit and a supportive network of physicians who paved the way. Direct Primary Care clinics are not required to report data to the government about which services they offer, how much they charge and how many patients they serve. As a result, little is known about the average income, health status, age and ethnicity of their patients and how they might differ from those in more traditional primary care practices. Proponents say relief from administrative paperwork is among the reasons Direct Primary Care clinics are attractive to providers. But the lack of government oversight worries those who would prefer to keep a closer eye on the quality and delivery of health care services. Direct Primary Care debuted on the health care scene around 2000 with a clinic called Qliance in Seattle. The clinic proved successful, attracting the attention—and investments of around $6 million—from Amazon founder Jeff Bezos, computer guru Michael Dell, comedian Drew Carey and other venture capitalists. But Qliance closed in 2017 following an unsuccessful pilot program with Washington’s Medicaid program. Qliance said it assumed more financial risk than it could manage for its patient population. Ultimately, it failed due to political pushback on the program. The Direct Primary Care model of health care could have benefits for Coloradans and their health care providers — from longer, richer visits to reduced red tape. But those benefits could come at a price. Opponents are concerned that Direct Primary Care could undercut traditional health care providers and make it more difficult for some patients to get care. 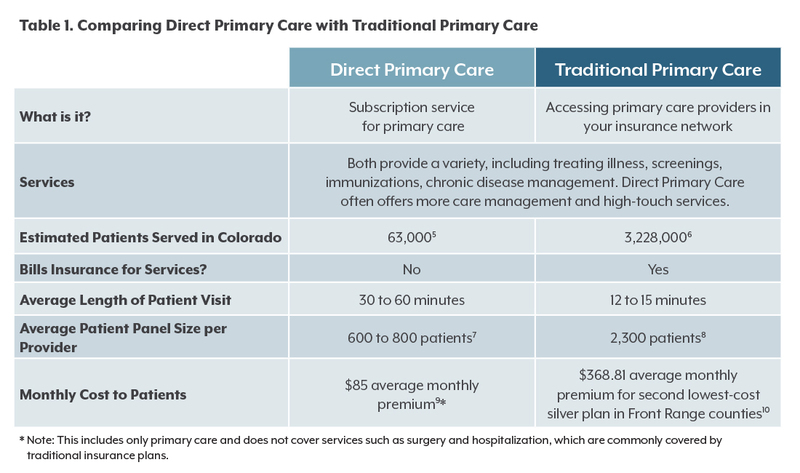 Could Direct Primary Care improve access to primary care in Colorado? More than 800,000 Coloradans reported in 2017 that they couldn’t get an appointment with a doctor’s office or clinic when they needed it.15 Others said they didn’t get care because the provider was too far away, they couldn’t get child care, or they couldn’t take time off work, among other reasons. In those cases, Direct Primary Care presents an attractive alternative—for those who can afford it. The monthly fee simplifies health care costs and offers appointment and service flexibility to access care when and where a patients needs it with services like mobile clinics and house calls. Will Direct Primary Care hurt Colorado’s health care workforce? Dr. Mark Tomasulo, founder of PeakMed, which runs a number of Direct Primary Care practices, says that while there could be a short-term impact on physician numbers, in the longer term he believes the personal and professional benefits of Direct Primary Care could reduce physician burnout, keeping them practicing longer and attracting more doctors to primary care. Swapping a high quantity of interactions for high quality interactions with patients could be a boon to primary care providers, he says. Would it create a “two-tiered” health care system? Some clinics in Colorado try to address this by seeing patients who are publicly insured outside of the Direct Primary Care framework. While it is illegal for a Direct Primary Care doctor to charge a Medicaid member for services, some operators run a parallel, traditional practice that takes insurance of all types, including Medicaid and Medicare. Others say they reserve a percentage of their patient load for “charity care” and see Medicaid and uninsured patients pro-bono. How could it affect Health First Colorado (Medicaid) enrollees? The American Academy of Family Physicians and the Colorado Commission on Affordable Health Care have both recommended pilot programs to allow Medicaid members to use Direct Primary Care clinics.23,24 To date, no efforts have been made to allow such a program, although some physicians are expressing interest in a test run. They believe a pilot could save the state Medicaid program money by keeping Medicaid patients healthier and avoiding costly medical expenses. Direct Primary Care has received a lot of attention as health care leaders consider how to fix a primary care system that often features high insurance prices, low satisfaction for both patients and providers, and less-than-optimal health results. Ever-increasing health care costs have some wondering if Direct Primary Care could be a solution for delivering efficient primary care in Colorado. But could it leave behind at-risk populations and the clinics serving them? It will be important for Colorado to weigh the potential outcomes. 1 Colorado Health Institute analysis of Colorado Direct Primary Care clinics. 5 Colorado Health Institute analysis of Colorado Direct Primary Care clinics. 6 Colorado Health Access Survey, 2017. 7 Colorado Health Institute analysis of Colorado Direct Primary Care clinics. 9 Colorado Health Institute analysis of Colorado Direct Primary Care clinics. 12 Paladina Health. “Your Available Locations.” https://www.paladinahealth.com/clients/state-colorado. Accessed June 27, 2018. 15 Colorado Health Access Survey, 2017. 16 Wu, WN et al. “A Direct Primary Care Medical Home: The Qliance Experience.” Health Affairs 36(5). (May 2017). http://content.healthaffairs.org/content/29/5/959.full?ijkey=5faaf28d6606e333829de56c2320df8d3d4f582e&keytype2=tf_ipsecsha. Accessed May 16, 2017. 17 Weisbart, E. “Is Direct Primary Care the Solution to Our Health Care Crisis?” (September-October 2013). Family Practice Management 23(5); 10-11. http://www.aafp.org/fpm/2016/0900/p10.html. Accessed May 16, 2017. 18 CHI calculated this number using CHAS data and average panel sizes for traditional and Direct Primary Care providers. 20 Alexander, GC et al. “Physicians in Retainer (“Concierge”) Practice. A National Survey of Physician, Patient, and Practice Characteristics.” Journal of General Internal Medicine (2005)20: 1079. https://link.springer.com/article/10.1111/j.1525-1497.2005.0233.x. Accessed May 16, 2017. 21 Eskew, PM et al. “Direct Primary Care: Practice Distribution and Cost Across the Nation.” Journal of the American Board of Family Medicine (November-December 2015) 28(6). Pages 793-801. http://www.jabfm.org/content/28/6/793.full.pdf+html. Accessed May 15, 2017.